Canada is a strong supporter of the rights of people of Hondurans. The promotion and protection of human rights, fighting corruption and improving the lives of vulnerable populations are at the core of Canada’s engagement in Honduras. Canada has contributed $3 million to the United Nations Office of the High Commissioner for Human Rights in order to support the office’s human rights monitoring capacity on an ongoing basis. In addition, Canada provided over $5 million to the Organization of American States Mission to Support the Fight Against Corruption and Impunity in Honduras (OAS-MACCIH). Canada also advocates for democracy in Honduras. Canada helped fund the Organization of American States’ Electoral Observation Mission in Honduras during the last Presidential election in November 2017, and supports the mission’s findings and recommendations. Following the elections, Canada publicly called for an inclusive and legitimate dialogue in order to resolve issues stemming from the electoral process, and has publicly called upon the Honduran government to investigate human rights abuses reported following the elections. We continue to monitor the situation closely and support a genuine and inclusive dialogue between the government and opposition. The Minister of Foreign Affairs has publicly called on the government of Honduras to reinstate constitutional rights and guarantees without delay and to uphold democratic principles, human rights, and the rule of law. With respect to Hondurans who have been arrested and detained during the post-electoral protests, Canada continues to call for the application of due process and respect for human rights, although the ability of Canada to provide direct assistance to Honduran nationals such as Mr. Edwin Espinal is limited. Embassy of Canada officials have visited various prisons to see detention conditions, and senior Canadian Officials have met with the Honduran Attorney General, the Vice-Minister of Human Rights, the President of the Supreme Court, and the Minister of Foreign Affairs to raise our concerns regarding the application of due process. Where are the Liberals with support for our campaign to free Edwin Espinal? Why does our government, specifically Minister Freeland, continue to associate with this oppressive Honduran regime, which illegally incarcerates Elmvale family member Edwin Espinal ? 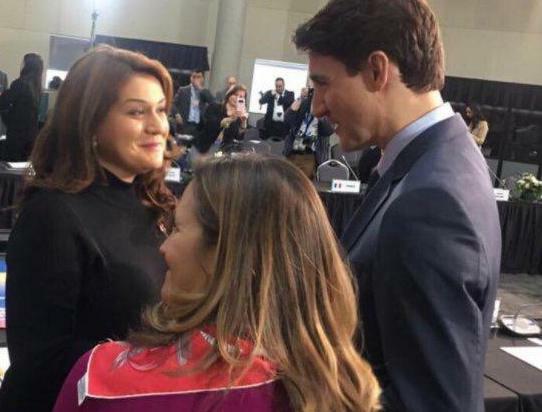 Canada, with Honduras and other suspect Latin American countries, is leading and participating in the LIMA Group, which is determined to support Trump’s attempt at regime change in Venezuela? Sever this relationship . This is a key election issue.